Riga [Latvia] 1917: The WWI battle that changed the world. Germans first used their new weapon, Yperite, contained in artillery shells. Yperite was a near odorless gas, affecting soldiers exposed with severe burns and blisters; the residue left on the soil proved to continue its damage if one touched it. Germany: WWII: Yperite – also known as Mustard Gas [Nitrogen Mustard] continued in use by the Germans. An explosion aboard a ship carrying Mustard Gas occurred with many fatalities. 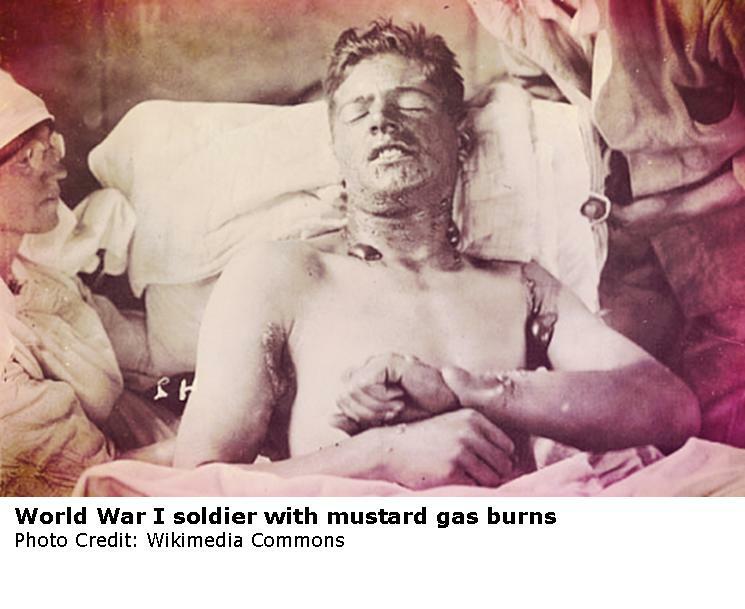 Autopsies reported fast growing cells were destroyed and white blood cells were dramatically slowed upon exposure to the Mustard Gas. The International Agency for Research on Cancer calls Mustargen a probable carcinogen or a cancer-causing agent. Yet in 1942 despite all the horrors seen as a result of Mustard Gas exposure to humans, scientists decided because it suppressed bone marrow function virtually destroying it, called bone marrow aplasia, to try to use it to treat lymphoma patients. Success is not really known for those first patients but we can surmise it was limited and is reported any positive effects were temporary. The research continued. What they did find was Nitrogen Mustard is an alkylating agent that modifies the DNA in your cells. By the 1950’s in London research led to the development of alkylating agents proving to be more effect called chlorambucil, melphalan, and busulphan; used as therapies for myeloma, lymphoma, and some leukemia types. These alkylating drugs are still in use today. Most patients given Nitrogen Mustard drugs have side effects ranging from low blood counts, nausea and vomiting, hair loss, mouth sores, darkening of the veins used for infusion, redness – dryness – irritation with topical application, loss of fertility, fever, diarrhea, poor appetite, metallic taste, tinnitus, and abnormal blood tests with increased uric acid levels. Low white blood cell counts, low red blood cell counts, and low platelet counts are common resulting in the patient with secondary infections. Those patients having repeated high doses of Nitrogen Mustard are at a risk for secondary cancers developing such as leukemia or other cancers. Dr. Mollie Hunter of the UK reportedly said after witnessing a patient who being given chemotherapy for her myeloma and steroids to treat her side effects, “ She really died of respiratory failure due to her curvature of the spine, due to her steroid treatment, but I signed the death certificate myeloma. It made me wonder at the time how often the true cause of death is recorded, i.e. the treatment and not the underlying illness.” So we must wonder how many death certificates are signed as ‘cancer’ being the cause of death, when in fact, the cause of death is effects of toxic treatment. How many given Nitrogen Mustard chemotherapy drugs are told they have a risk of infertility? Many are given these drugs during pregnancy when it is reported these drugs could cause birth defects. Others still are not given the opportunity to harvest eggs or sperm for future attempts for reproducing after treatment ceases. With many non-toxic alternatives to treating cancer available we wonder why the continuation of using a chemical warfare poison is not only in used but allowed. Clearly, there are more cons than pros; yet in spite of the overwhelming side effects doctors continue to tout these drugs as beneficial. If these are so beneficial and safe to use on the patient why then we ask are these chemo drugs listed as Hazardous – and if a spill or accidental exposure to them by other than the patient occurs extreme measures are taken. All materials touching the chemo drugs are to be disposed of as BioHazard Waste. If a family member comes in contact with the chemo drug they are directed to an emergency room. And we are to believe somehow it is hazardous to others but not the patient. Burns occur on our hands if we touch it, so what happens to the patient’s veins? Alternative cancer treatments have no side effects, cancer is killed, health restored; a well-planned protocol of alternative cancer treatments gives a longer lifespan and quality of life. In Germany where the poison began, support non-invasive cancer treatments often over poisonous options; other European countries have developed their own non-conventional treatments, making alternative cancer treatments mainstream. So why in the countries like the US are we using Nitrogen Mustard on our people rather than superior non-invasive treatments? Cancer treating is big business, very big business bringing in billions of dollars, is anyone within this industry willing to give up the profits for truly caring for the patient? Nearly one hundred years after its first use in Riga [Latvia] Nitrogen Mustard still continues to kill. Did the Germans ever imagine how they would have changed the world? What’s up,I check your blog named “Mustard Gas – from WWI to War on Cancer – Chemical Warfare Exploited | Jesicha’s Hope” regularly.Your writing style is awesome, keep doing what you’re doing! And you can look our website about love spell.